Jonathan Goodman is Chairman and CEO of Dundee Corporation, a diversified holding company with investments in companies in the wealth management, resources, agriculture and real estate verticals and President and CEO of Dundee Goodman Merchant Partners, a mining focused merchant bank. Mr. Goodman served as CEO of Dundee Precious Metals (DPM-T) from 1995 to 2003, Executive Chairman from April 2013 to September 2017, at which time he was appointed Chairman. Mr. Goodman also serves as Chairman of Toachi Mining Inc. (TIM-V). Mr. Goodman has over 30 years of experience in the resource and investment industry, working as a geologist, senior analyst, portfolio manager and senior executive. 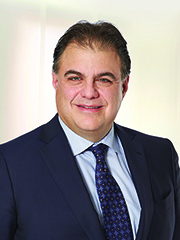 Mr. Goodman joined Goodman & Company, Investment Counsel Ltd. in 1990, where he was responsible for the selection of Canadian equities and played a major role in developing asset allocation strategies, before becoming the company’s President. He is also the founder of Goepel Shields and Partners, an investment firm. Mr. Goodman graduated from the Colorado School of Mines as a Professional Engineer, holds a Master of Business Administration from the University of Toronto and is a Chartered Financial Analyst. Mr. Goodman also serves as the executive in residence for the Faculty of Management at Laurentian University.